Georgia is a global center for logistics technology, with an infrastructure that includes almost 300 companies involved in the development of technology to manage the flow of materials, their transformation into finished goods, and their ultimate delivery as finished goods to the final buyer. Supply chain and logistics technology covers numerous elements of the process, including inventory, transportation, production, and procurement and the information flow to facilitate these activities. 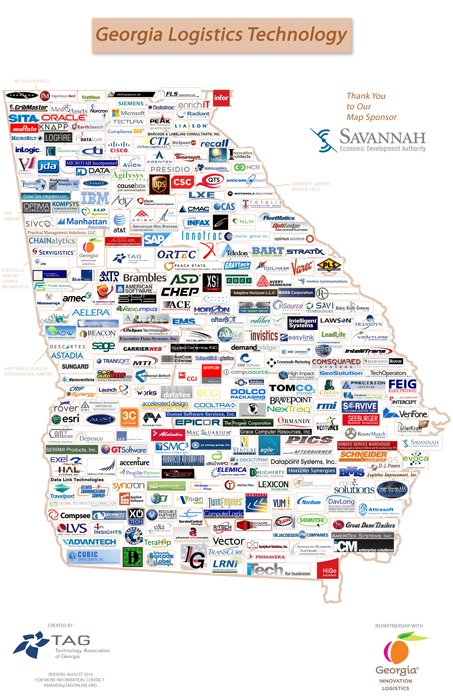 Georgia’s logistics technology companies support the more than 11,000 providers of logistics services operating throughout the state. Georgia is the 12th-largest export state and 9th-largest import state in the U.S., making it a natural fit for companies developing technology to improve the supply chain and logistics process. The world’s busiest passenger airport, two deepwater ports, two Class I railroads with the largest rail hub in the southeast, and the most extensive surface transportation network in the country further contribute to Georgia’s logistics prowess. At the root of Georgia’s logistics technology industry is a deep network of skilled talent. The state is ranked 5th in the nation for logistics employment and 86 colleges, universities and technical colleges offer more than 100 logistics-related courses. In fact, the Georgia Tech Supply Chain & Logistics Institute (SCL) is the largest logistics-related research and education enterprise in the world. Further contributing to the success of Georgia’s logistics industry are strong and active organizations, including the Technology Association of Georgia and the Center of Innovation for Logistics.